I have stayed at Disney's value resorts many, many times. I have stayed in a moderate and a deluxe resort once each. Naturally the former have a great many amenities to recommend themselves over the cheap option, but since I'm not a high-powered executive I tend to stay at good ol' Pop Century anyway. For the most part, I don't miss much - sure, the nicer rooms, more impressive lobbies, and more extensive food choices are nice, but I'm mostly in the room to sleep. Who cares? That's combination shampoo/conditioner, people. Or "conditioning shampoo" as some call it. 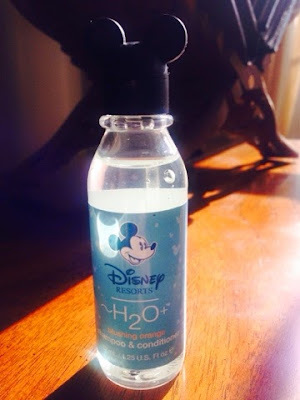 Disney seems to be claiming that it is a bottle containing both shampoo AND conditioner in defiance of all logic.. That is some sub-Econo Lodge nonsense right there. I get that a value resort does not deserve high-quality toiletries, but come on. We're paying twice as much as your average Econo Lodge room for your "value" option - can we not get actual, honest-to-God separate shampoo and conditioner here? I can assure you the difference is real, and it would save me having to lug my own bottles to and from home, to say nothing of heavy luggage and spillage risks. Don't be ashamed, guys. Your value-level soaps and such smell lovely - digging the orange blossom stuff that started showing up a couple years ago! I'd love for my hair to smell like that, but I'd also love hair that isn't a tangled mess. You finally gave us refrigerators, and I'm sure that was a much larger expense. Won't you give us this tiny upgrade?